Whether you’re from out of state and want to experience the real Oregon or you’re from the area but are looking to impress your out-of-town friends, you don’t need to travel far. Less than an hour and a half from Marathon World Headquarters in Coburg, Ore. is a place of great awe. 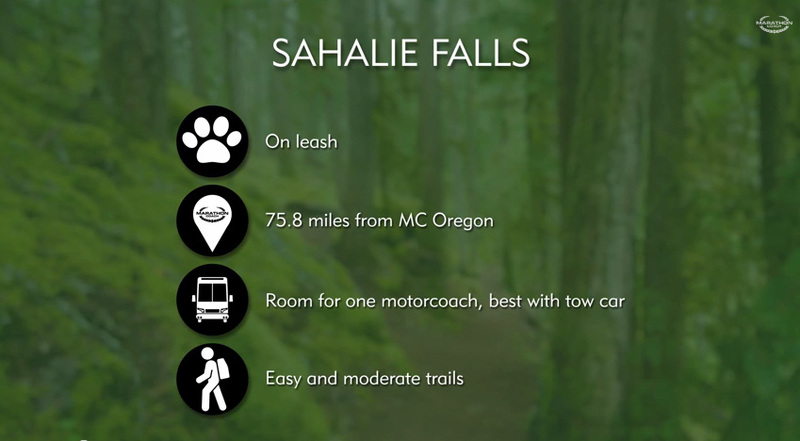 Sahalie and Koosah Falls stand majestically at 100-feet and 70-feet tall respectively. Both fed from the crystal clear McKenzie River, they are nothing short of stunning. It’s a good place to take your coach for a day trip or drive your tow car while your Marathon is being serviced. Whatever you do, don’t forget your camera. Bus Parking: Bus can be parked at Sahalie Falls, but is challenging. There is no bus parking at Koosah Falls. The walk from the parking area to the falls themselves is quite easy. The waterfall loop hike begins at the 100-foot-tall Sahalie Falls, through Douglas fir and red cedar laden terrain to Koosah Falls a half mile or so later. However, for better views, continue your hike, keeping right after the latter fall. In less than a half mile you should see a gravel road alongside Carmen Reservoir. Follow this road until you see a trail sign in 150 yards or so. Take this path into the woods and turn right onto the McKenzie River Trail. This will lead you to plenty of gorgeous photo opportunities including better views of both Sahalie and Koosah Falls. After a mile or so, you’ll cross the river on a footbridge, another excellent place to take snapshots. Then turn right and you’ll have less than a half mile to your car. Due to the split rail fencing, pets should be leashed so they don’t fall down the hills, cliffs or falls. Amenities: Porta potties are available for use at both locations.